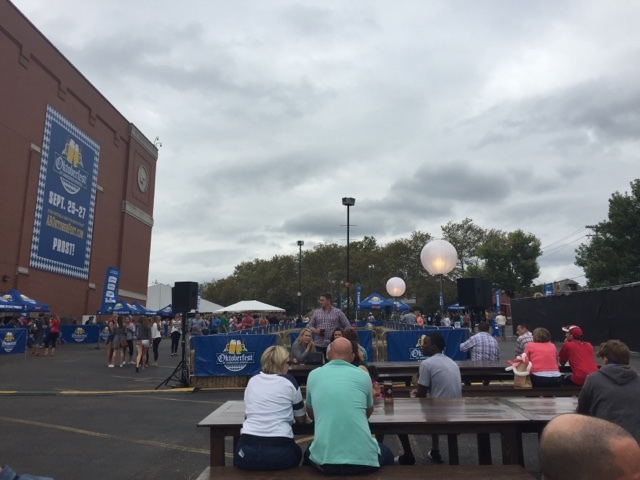 This past weekend, Jeff and I had the opportunity to attend the first ever Oktoberfest at Anheuser-Busch! The day was gorgeous. Miss H was napping at Grandma’s so we made a day date out of it! Each ticket came with a wristband for a stein, 2 beers and a food item. These were big steins and AB had the good stuff on hand! They had 2 Oktoberfest’s on hand as well as my personal favorite Franziskaner or as I call it – Monk Beer! They also had a handful of other options too! There was tons of seating all around. Tables outside, under tents and the Biergarten was also open. We opted to hang out there for a bit and enjoy the breeze. Gorgeous day. They also had a few other beer options in the Biergarten – and I was able to get a Hoegarten for my second beer! Yum! We got to meet the world famous Clydesdales. Even being a St. Louis native, they are still so gorgeous to see up close. This was Rascal. 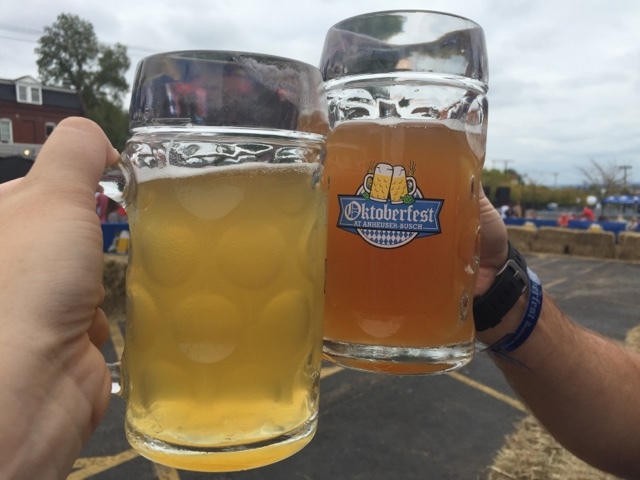 Props to ABOktoberfest for having someone there to take photos for you. You just handed them your phone, they took a landscape and portrait shot and you went along your way. Brilliant! In addition to fun music, they also had Beer Games hosted by That One Guy. If you’ve been to a Cardinals Game – you know who I’m talking about. He’s the announcer of the seat games during the game! He was hilarious. They had Chug & Skip, Straight Arm Stein holds and barrel racing. Anyone could sign up, and it got pretty competitive between groups of friends. We must have stood there for a good hour watching the shenanigans going on! After checking out the Clydesdales and games and another beverage, we ventured into food territory. Deep fried pretzels with beer cheese – I die. And a Gingerbread cookie the size of Canada! We ate on that for days! They also had traditional brats that looked amazing too! I am seriously wanting one of those pretzels right now! Thank you to Anheuser Busch for the tickets to attend the event and the tickets for the giveaway I hosted last week! This will definitely be on our radar for next year too! Disclosure – I was given 2 tickets to attend and 2 ticket to giveaway in exchange for an honest review of the event. In no way did this sway my opinion. It was a ton of fun! How fun! Going to keep an eye out for next year! How fun! Oh, the things I miss out on living in a small town 😉 I would do some SERIOUS damage to that pretzel!! Looks like so much fun! I wish we would have been able to go to this one too!